Worship is the starting point of all ministry, especially the ministry of the church. Accordingly, it is our Sunday morning service that serves as the anchor of all we do at First United Methodist Church. 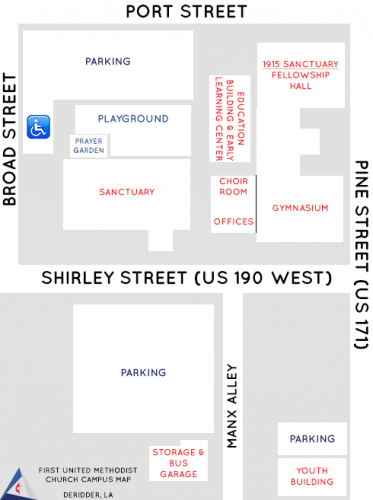 9:00 - 9:45 am: Sunday school is available to adults, youth and children upstairs in the Historic Fellowship Hall. 10:00 am: Sunday worship is in our Historic Fellowship Hall during the summer and in the Main Sanctuary during the rest of the year. 5:00 - 6:30 pm: We have Sunday Night Ministry for our children ages 4 - 5th grade, KREWE for our Youth and Bible study for those adults looking for fellowship and to expand their understanding of God's love. 8:30-12:00 & 1:00-3:00 Monday-Thursday, and 8:30-12:00 on Friday.